The gems inside historical Irish newspapers have only recently become a staple of genealogical research. This might have been because newspaper collections were held in only a few major repositories, so a personal visit was required. But it was also because, without an index, any research project was incredibly time-consuming, as the family historian waded through page after over-sized page. Microfilm didn't make the task much easier, either. Fortunately, the last few years have seen a bit of a revolution in newspaper archiving, and this has really opened up incredibly exciting and enjoyable resources. The only negative is that it's terribly easy to get side-tracked! Birth, engagement, marriage and death announcements: The hatch, match and despatch columns used to be one of the most popular sections of newspapers and can still provide the all-important basic data for your family tree. Often a bit of additional information is supplied as a bonus. Placing such announcements was obviously not a high priority for the average poor labourer's family, but if your ancestors had a few bob or a certain social status above the bottom rungs, you may find announcements of interest. BMD announcements in old Irish newspapers can be especially useful for the pre-civil registration era in areas where no church registers survive, or where records seem to be missing. Leads: Many news stories will provide snippets of information that you may not already have, or that can direct your research to new resources. Names, ages, residence/place of origin, occupations and marital status are the standard components of any news feature, so these details may be recorded not only about the subject of the story but also about his/her spouse, offspring and wider family. Obituaries, in particular, can be extremely useful for this kind of information; and they're not just the preserve of the rich or remarkable – a report in a local newspaper of the 1892 funeral of one of my ancestors read like an obituary, with its references to his shop and some of the community events in which he'd been involved. As with any searchable online collection, OCR (optical character recognition) technology may not pick up the correct spelling of the names or words you are searching for. It's also possible that the journalist mis-spelt the name or word in the original article. It's also perfectly possible that the name or the placename is open to all manner of spellings. To help find matches in old newspaper archives, search for variants, use wildcards (where applicable) or try using Advanced Search options to focus on specific dates and/or places. Insight to character: Historical Irish newspapers can provide more of an insight into your ancestors' lives and characters than regular genealogical documentation. The level of detail in some reports – criminal proceedings, inquests, marriage scandals and other sensational stories – can be a real eye-opener. My own example, albeit not exactly sensational, concerns my gt gt grandmother, Sophia, who was born in 1840 into a prominent and reasonably prosperous (but not wealthy) sea-faring family from Wicklow Town. Family tales had held her up as a beacon of saintliness. So I was rather surprised (and rather delighted, to be honest) to find several entries in the Petty Sessions Order Books relating to her regular altercations with neighbours. Newspaper reports of these court appearances painted a completely different view to the butter-wouldn't-melt, slightly snooty picture that had filtered down the years. Backdrop ‐ your ancestor's social scene: If you want information about your ancestor's locality, a contemporary newspaper can be a treasure trove. And not just in the news stories. Adverts, too, tell you a lot about the area, the neighbours, and the kind of products they might have bought or aspired to buy. You can also find details of local markets – when and where they were held, and even the price of eggs, butter and more. And then there are reports of community events such as dances, sporting challenges, agricultural shows, and the meetings of local political and social organisations. 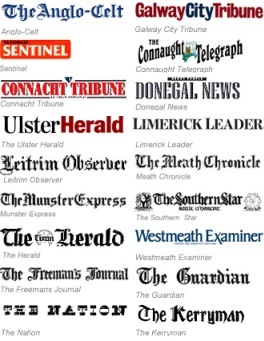 Irish Newspaper Archive: As you can see from the image below, the Dublin-based Irish Newspaper Archive (INA) has a terrific collection of local papers available on subscription. INA's collection covers all the island's counties. Click to view titles. INA has long been one of my top sources for information that tells me about the kind of people I'm descended from, and the lives they and their families led. My paternal ancestors, for example, were labourers from West Cork and they crop up on occasion in news reports of various social meetings and political rallies, or for sporting prowess or for attending funerals or for emigrating. None of it's earth-shattering, but it helps to make them people, rather than just names attached to birth and death dates. The database is made up of old papers from across the island, and includes national and local titles. Some have a complete run; some do not. The Belfast Newsletter, for example, is missing some editions but it spans 1738 to 1900. The same applies to its holding of Freeman's Journal, which was published from 1763 to 1924. These two examples are reminders to always check the dates of coverage if you are looking for specific information from a particular time in your family history. The site holds complete runs of both The Irish Independent and The Irish Press, which date from 1905 and 1931 respectively. British Newspaper Archive: This online resource, launched in 2013, is a partnership between the British Library and the owners of FindMyPast. It aims to digitise up to 40 million newspaper pages from the British Library's vast collection by 2021. That collection spans three centuries and includes 52,000 local, regional, national and international titles. With more than 30m pages of newsprint converted into digital files by early January 2019, the British Newspaper Archive has quickly become one of the major genealogical resources available to those with ancestors from the geographical British Isles. As you'd expect, the bulk of the archive is made up of English, Scottish and Welsh papers; these can be extremely useful to family historians of Irish heritage because so many of our ancestors settled or spent time on the British mainland. However, at the end of January 2019, some 167 historical Irish newspapers had made their way into the database. As well as some of the 'national news' papers – the Belfast Newsletter, Freeman's Journal and Cork/Irish Examiner – a host of local and regional titles are included. Many of the latter have evocative names: Galway Vindicator, the Sligo Champion, the Downshire Protestant and the Wexford Conservative. The BNA's entire holding is also available via FindMyPast as part of some subscriptions. 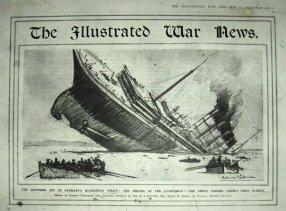 Irish Times Archive: The Irish Times Archive is undoubtedly one of the most significant single collection of Irish historical newspapers currently available online. The paper dates back to 1859 and has been regarded as Ireland's newspaper of record since the early 20th century. Its archive includes almost every issue published in the last 150 years and holds 16m articles. At January 2019, the subscription rates start at €10 a month (there are frequent offers, especially for overseas readers - check this website's Special Offers page). It's worth noting that access to the Irish Times Archive is provided free of charge at public libraries and schools in Ireland via AskAboutIreland. Ancestry and FindMyPast: Both these suppliers of online family history records hold collections of historical Irish newspapers. Their respective offers are summarised in the right hand column of this page. Ancestry and FindMyPast: Both these suppliers of online family history records hold collections of historical Irish newspapers. Their respective offers are summarised below. FindMyPast is owned by DC Thompson Family History, the company partnering with the British Library to create the British Newspaper Archive (see main text). Understandably, then, it has a big collection of newspapers at its disposal and a growing number (157 in July 2018) are of historical Irish newspapers. These are included, without any extra charge, in the Ireland and World subscription packages via FindMyPast.ie and some other packages from FindMyPast.co.uk and .com. So, too, are two collections of newspaper extracts. The first is the Tipperary Clans Archive, which is an index of 157,000 death and funeral notices and obituaries, all extracted from newspapers. Most relate to the province of Munster. Similarly, extracts from the Irish Times make up Byrne's Irish Times Abstracts 1859–1901. This collection is not focussed primarily on death related issues; its remit includes records of accidents, suicide, employment, social activities, court cases, property sales, property lettings, sanitary conditions and more. It's very Dublin-centric, and about 200,000 names are recorded. Freeman's Journal is one of the most important historical Irish newspapers. It was published in Dublin from 1763 to 1924 when it was merged into the Irish Independent. During the 19th century it was the leading national title and covered everything from foreign news to national and local news of events in Ireland. The huge Ancestry database has a relatively small collection of historical Irish newspapers. It holds the Belfast Newsletter 1738–1925 in browsable (by date) format, and a free World Archive Project (completed by volunteers) collection of birth, marriage and death announcements extracted from editions published 1828-1877. Also in a browse format is a database that contains various editions of more than 30 historical Irish newspapers, including the Irish Times; this collection spans the years 1763 to 1890. There is also a fully searchable text version of the Freeman's Journal for 1763–65 only. 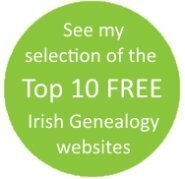 Check out Irish Genealogy News blog, the sister site of Irish Genealogy Toolkit, to keep up to date with the world of Irish family history.